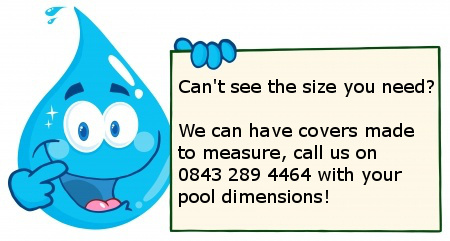 The 'Industry standard' pool cover offering a good quality solar cover at an affordable price. Unlike other online retailers, our solar covers are manufactured here in the UK at Plastica's manufacturing plant in Hastings, and come with a 3 year pro-rata warranty (UK & Eire only). A solar cover is a major part of swimming pool equipment and is considered to be absolutely essential for outdoor pools. 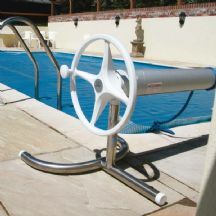 A good quality cover will transmit free solar energy into the pool, making the water warmer by transmitting heat from the sun directly through the specially sealed bubbles into the pool. It will also help reduce water evaporation which helps save on the pool chemical usage and with extra heat retention in the pool during the night, for pools which are heated by gas or other traditional methods the cover will help reduce energy requirements. Please note that solar covers are not safety covers, and should not be used as such. Unlike many other online retailers, our covers are made to order here in the UK by Plastica at their manufacturing plant in Hastings. Covers are manufactured to order, so delivery times will usually be 4-7 working days. Please note that as this product is manufactured to order, we cannot accept any returns on these covers. The Slidelock Reel System is generally considered within the industry to be the best domestic reel on the market.